The Ruling Class Meeting James McAvoy "How do you know you're God?" "Simple when I pray to him I find I'm talking to myself." 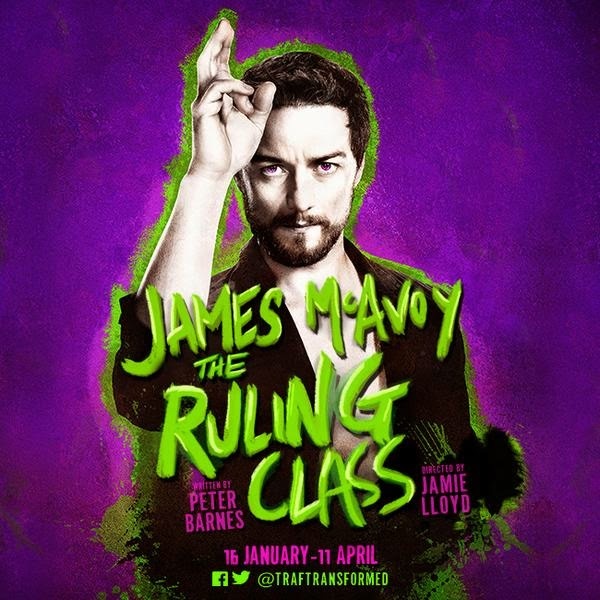 On 19th March 2015 I went to go and see James McAvoy in the theatre play The Ruling Class with a great friend. It was just wow truly It's a revival of the original 1968 play, by Peter Barnes that then went on to be adapted into a feature film with the same title in 1972. The Ruling Class sees James McAvoy as the main character, he plays Jack Gurney, he is a paranoid schizophrenic and he believes that he is God. When his father the 13th Earl of Grey passes away it falls to Jack to take his place and become the 14th Earl. His friends and family struggle to come to terms with his new proclaimed identity and unpredictable behaviour. That includes sleeping upright on a cross at night and breaking out into song and dance randomly. He blatantly ignores any responsibility given to him and makes them disappear by putting them in his galvanised pressure cooker. Hello galvanised pressure cooker genius! His uncle starts a plan to put Jack in a institution so he can gain control of everything. Whilst taking my seat I only knew a little bit about what the play was about from watching James McAvoy recent interviews on TV promoting the play. Also my friend and I had really good seats I've never been to Transfalger Transformed so I didn't really know what the seats were like. I wasn't worried when I got there the stage was really close and we had an amazing view. It's a bit like a cinema screen it doesn't really matter what seat you have you will have a good view. Anyway the story was quite easy to understand, it gets going rather quickly and sets the pace for the whole play. The start of the play sees Jack's father and family butler. Shortly after he met his demise the audience are introduced to Jack the 14th Earl of Gurney to begin the story. The first part of the play is lighter it does include dancing, singing and great one liners which are great when the play is so intense at certain moments. And all of sudden the characters break it down by bursting into song and dance. Which I think is great as it can really help in those intense scenes just by taking the scene in a completely new direction. I knew James could sing but I didn't know he could SING and he is a great dancer too. There is lot's shirtless moments where James character has God Is Love written across his chest. There's a scene where James character Jack comes on the stage riding a unicycle in just his whitefronts. He had to ride round and round and say his lines at the same time, I know I wouldn't be able to do that. Serosuly is there anything this man can't do he has so many talents. As the story unfolds we see the role as weighty as playing a mentally ill person obviously is. James truly does embody all the aspects and this shows out in his incredible performance as always. He truly gives it his all physically, mentally and emotionally when playing Jack and that was incredible to watch he does this daily sometimes even twice a day. As soon as James enters onto the stage he owns it his Olivier nomination is certainly well deserved. You could not take your eyes of him when he graced the stage, no matter how hard you tried. He has this presence that even when he wasn't speaking I still found myself looking at him to see his character's reactions. Whenever he was on stage I felt constant anticipation for James and his character. The moment he appeared on stage I was completely mesmerised by him, I still couldn't believe I was watching James McAvoy on stage in front of me I hope the audience felt the same. You literally have it all in The Ruling Class it will make you laugh, it will make your eyes go wide with terror. Also it will leave you feeling completely dumbstruck by the story that is unfolding in front of your eyes. I left the theatre on a great feeling like I just witnessed something truly beautiful and incredible and I was so thankful for it. I do love the theatre every time I've been lucky enough to see a play I always leave and feel amazing that I've seen something extraordinary, I feel the same way about films too. Does anyone else feel like this? The first half of the play is funny, light and the audience are introduced to the characters. The second half of the play is dark, intense, dramatic and the audience already know the characters obviously but we are learning new sides to them, that the audience didn't even know existed. This is the perfect time for the play to be showing especially with the General Election 2015 in London.